What is a Spanish Galleon? A Spanish Galleon was a huge sailing ship that was comprised of multiple decks that were constructed and used by European states between the 16th and 18th centuries. Actually, it is very likely that these kinds of ships were used for crusades throughout the 12th and 13th centuries. 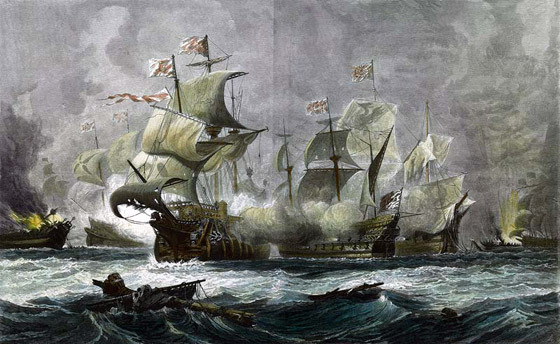 In fact, in English, “galleon” translates into “man of war.” These kinds of ships were longer, lower, and narrower–most were over 1000 tons. They were very good investments because while they were heavy, sturdy ships, they were still relatively cheap to construct. Galleons were also able to carry heavy weaponry and lots of it. A Portugese Galleon the São João Baptista, nicknamed the Spitfire, carried nearly 360 guns. But as the times approached the 16th century, Galleons began to carry less weaponry in order to make more room for goods. While Galleons still carried weapons to protect their treasures, they stopped being used as warships.